Oddworld-creator Lorne Lanning says that Microsoft "isn't acknowledging" smaller developers. Microsoft doesn't have the best reputation with independent game developers. While the company's digital storefront helped to launch several prominent names in the indie scene to success, recent years have seen its relationship with many independent developers degrade to the point many are opting out of future Xbox releases. While some entities would insist that Microsoft does in fact value independent developers and their products, others have had a less rosy view of the company. Among the disgruntled is Lorne Lanning, founder of Oddworld Inhabitants and creator of the Oddworld series. "At the business level, Microsoft isn't acknowledging people like us," said Lanning. "It's as if we don't matter." Lanning's opinions on Microsoft's handling of indies comes primarily from his own efforts to secure a release for his company's game Oddworld: Stranger's Wrath HD. 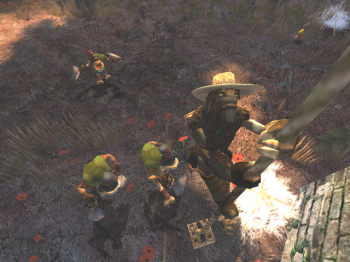 Stranger's Wrath HD, intended to be a revival for the Oddworld series, wound up not releasing on Xbox 360. "We couldn't get clear answers for 15 months," said Lanning. "We don't have five biz dev guys and two attorneys and some PR people to send up there to roll out whatever carpets you have to roll out to get attention." According to Lanning, Microsoft failed to respond to inquiries until Stranger's Wrath HD landed on the competing PlayStation Network. "We release on PSN, and we get a mail the next day that says, 'Oh, you released on PSN at a lower price point, you didn't meet our margins, sorry you can't be on the system.' Boom. And that was it." While Microsoft repairing its relationship with indie developers isn't outside of the realm of possibility, recent actions by the company have arguably demonstrated that it intends to continue with things as they are, and perhaps even make some things worse. In addition to maintaining unpopular rules requiring indie games to find a publisher before they can be ported to Xbox Marketplace, the company recently revealed it would be dissolving its indie game section altogether. "People like us are clearly not in Xbox One's business model," said Lanning. "And there's nothing we can do about that."